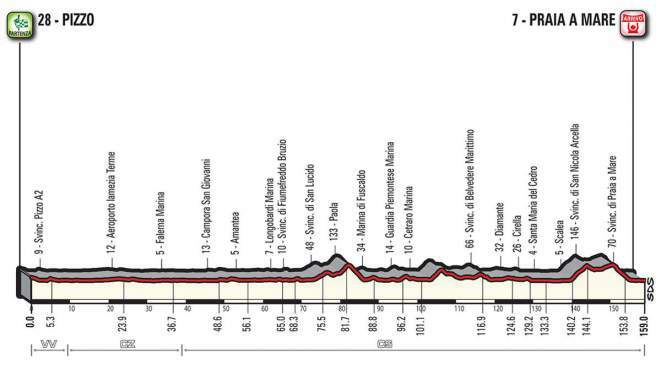 The whole stage running the national road Strada statale 18. It is suitable for the sprinters in the bunch. The course coasts the Calabria’s Tyrrhenian Sea from Pizzo to Praia. Before reaching the 3-km home stretch on the waterfront, the riders will race across the town. No categorized climb in this stage, just like the TT and the final stage. Same finish as in 2016, when Diego Ulissi won solo, but this time there won’t be the 18% gradient climb in via del Fortino: from Scalea the course remains on the new SS. 18, avoiding the demanding section of S. Nicola Arcella featured in 2016.